Who doesn't like dressing stylish in men's fashion blazer jackets when style counts. The unique style that you see in men's fashion blazers are always fun to wear when you go the club or perform on stage. 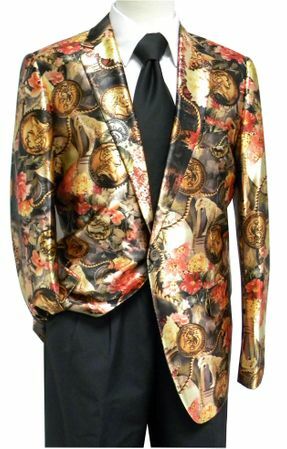 This brown coin pattern fashion blazer jacket is made of all satin fabric and features a Versace coin style pattern that will really set you apart from the boring people in your vicinity. Featuring a modern fit and side vents, this men's fashion blazer will be a great addition to your fashion attire.